I’ve not done an ordinary moments post for ages but it’s something that I want to get back into. 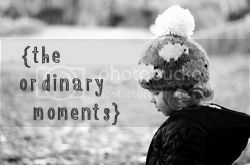 Recording the everyday moments that would otherwise be forgotten is the reason that I started blogging in the first place. One thing that I really cherish at the moment is mine and T’s lazy mornings. I’m really lucky that I only work two days a week so the other five days we can start the morning at our own pace. Little T generally doesn’t wake up until about 8am. He’s still in a co-sleeper cot next to our bed so we cuddle while we both wake up. T usually gets out some of his books (his pop-up tractor book being a particular favourite at the moment!) and will look through them while I check out Facebook, or something equally intellectual, on my phone. One thing that always features in our lazy mornings in the half-darkness is Cat. T never had a favourite soft toy, until he found a little tiger at my parents’ house about a month ago. He loves ‘Cat,’ cuddles him to go to sleep and looks for him as soon as he wakes up. I know these magical mornings won’t last forever. I’m sure there’ll be some adjustment in July when T’s little brother or sister makes an appearance, and even before then when T moves into his own room to make space for the baby, but I do hope it’s something that we can continue with three of us (or four at weekends). I’m sure I’ll look back very fondly on these lazy mornings with Cat in a few years time when I’m rushing around to get us ready for the pre-school/school run. Ah, these mornings sound lovely and relaxed. Our mornings are a bit busier as I desperately try to squeeze in a shower before hubby goes off to work. Love the photos of him with Cat too! The lazy mornings really are great. I know that they won’t last so I’m enjoying them while I can! The lighting is terrible and they’re not the best pictures, but I think they’re great because they shows how much he loves his Cat!